To add pictures please drag them from File Explorer (Windows) or Finder (Mac) into the list at bottom of the design area, you may also add pictures using the button “Add pictures” at right bottom or the menu available right clicking over the pictures list at bottom. To add pictures to a sheet drag them from the list at bottom into the sheet (left, right or middle). If you drag one picture to a picture already on this spread they will be swapped, if you drag one or more pictures to an empty place in the spread all old pictures will be replaced by the news, if you prefer to add the new pictures please press ALT while dragging and dropping the pictures on the sheet. Dropping more than one picture to a single picture in the spread has no action because one picture can’t be replaced by many. You may drag also one picture to the border of one or two pictures, the new picture will be inserted between or at the border ( a red line appears). At the right of the pictures list you will find an option to filter pictures by folder, you may select any combination of folders. To move a picture click to select it and drag the mouse. You may also select a group of pictures and move them together. To resize a picture click to select it, then drag with the mouse from the borders or corners of the picture (in yellow). You may also select a group of pictures and resize them together. To swap one picture with another in the same spread please press ALT and then drag the source picture to the target one, both pictures will be swapped. New album: To create a new album please select a folder and input a file name, this name will be used for the album database. Once accepted a window will open to set album sizes. You may input the size of the album sheet and the cover and back sizes. Margins will be shown in the sheet design and will help you not to place important portions of an image, frames, texts, etc on the margins. Edit album: Edits the current sizes of the album, you may create a copy of the album with a different size by entering a different file name and / or folder. All spreads will automaticall be resized to the new settings. Open album: Opens an album by selecting the album database file. Album TD database files are in .db format. Autodesign album: Designs all the album shpreads automatically. You have to select the pictures to be used, click at this option and input the number of spreads. You may also set the vertical and horizontal margin and separation between pictures for all the spreads. Once the automatic design is made you may modify it, add more spreads or remove them. Cover and back have to be designed manually. Export to Photoshop: Exports the spreads to Adobe Photoshop© version CS to CC 2015, requires having Photoshop installed. Export to JPG / TIFF: Saves all sheets and creates the final sheets in JPG or Tiff format into the folder you select, they are exported at final resolution and using the sizes input for the album. You also may split the sheets and create a PDF format preview or watermarked smaller previews for album proofing. Dynamic preview, shows the layouts filled with the current pictures in the spread including backgrounds, clipart, etc as a true preview of the result you will get by selecting this layout. Adjust layers to album margins, this option places the image layers into the safe area defined by the margins of the album except for images at full bleed. Pictures editor. Selects the external pictures editor, you may use Adobe Photoshop or any other application capable of opening pictures included as executable parameter. License: To input your license details and activate it. Get new layout: Replaces the layout of the currently active spread with another one randomly selected from the layouts list. Masks: Shows the masks in an independent window. Drag a mask to a picture in the editor to mask the picture. Then you may use the brush to retouch the mask. Ctrl / Cmd + 3 to open this window and Ctrl / Cmd + W to close it. Backgrounds: Shows the backgrounds in an independent window. Drag a background to the spread in the editor. Right click over a background in the editor to set opacity, hue and saturation or delete it. Ctrl / Cmd + 4 to open this window and Ctrl / Cmd + W to close it. Cliparts: Shows clipart in an independent window. Drag a clipart to the spread to add it. Ctrl / Cmd + 5 to open this window and Ctrl / Cmd + W to close it. Layout: Shows the layouts available for the active spread with dynamic preview (if set in preferences). Click at a layout in the list to change the current layout in the editor or multiple view. Ctrl / Cmd + Y to open this window and Ctrl / Cmd + W to close it. Undo: Use Ctrl / Cmd + Z to undo the last change in the active spread. Maximum number of steps to go back is 9. Swap images: Swaps the image selected in the Cut process (if more than one picture was selected only the first is taken) with the currently selected one. 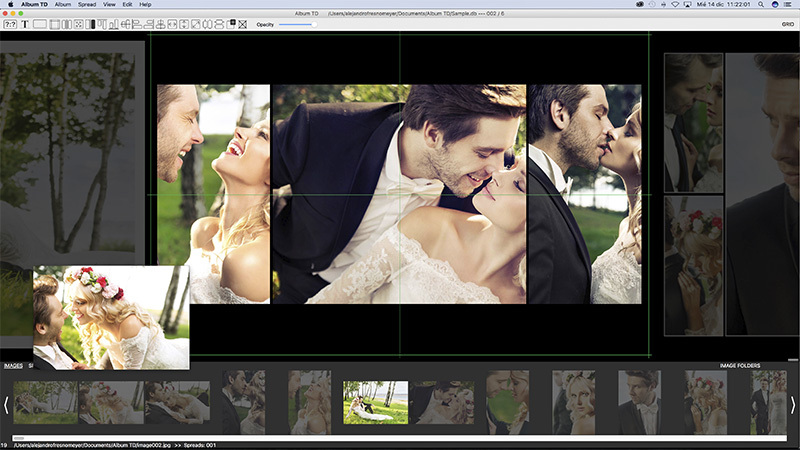 This process can be used in the same spread or to swap images in different spreads. Enables the 2:3 aspect ratio mode, the layouts shown are ready for layers fitting picture size and all resizes are done keeping aspect ratio. Clicking at this icon you may select a margin around the pictures to separate them horizontally and vertically from the borders of the spread. Sets a gap or distance between the pictures in the spread. Indicates if the pictures have to be placed centered or adjusting at the top left corner. If your pictures have a centered subject you will be more comfortable with the centered option. Flips the current sheet placing left design on right and viceversa, if you press Ctrl / Cmd while using this option the flip is in vertical placing the top part at bottom. Clipart and text doesn’t change. Equals the size of the selected pictures to the first selected.